Woke up this morning to find that it actually wasn't morning... on this planet anyway! It made the investigation of the deep trenches here a little more attention-getting than I expected. Decided it was better not to risk Star Reaper down a trench, so took the condor out. Leaving Cathy in charge of Star Reaper and under strict orders not to follow me down, I descended carefully into the darkness of the trench we had camped next to. 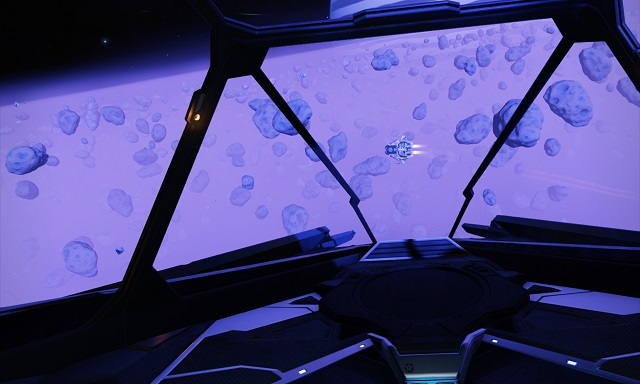 The new night vision that the Pilots Federation has made mandatory on all ships was worth it's weight in void opals. By locking on to Star Reaper, sitting in a holding formation at the planet surface, I was able to measure the depth of the trench at 17 km, and I bet this wasn't the deepest one! Now I got sense of how the ancient Earth submariners must have felt descending into the depths of Earth's ocean trenches many centuries ago. Slightly claustrophobic if I'm honest, as the walls closed in around me. 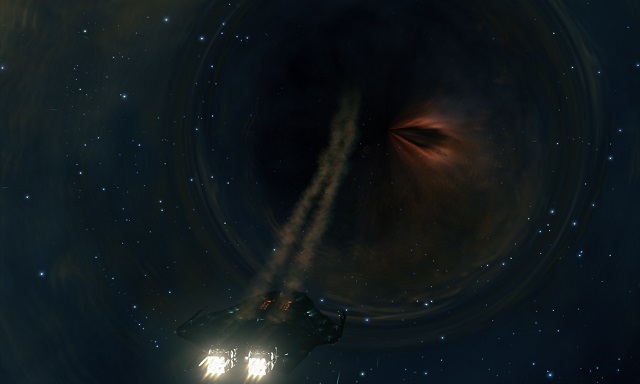 Next stop was Thor's Eye, 150ly and 3 jumps away. Had time for a bit of 'roid surfing in the beautifully pink-lit rings of the system gas giant, and let Cathy take the throttle of Star Reaper while I put the condor through it's paces. It was good to practice a bit of formation flying, and we both stayed off the rocks, which was a bonus! Thor's Eye itself is an impressive black hole and from our approach, was backed by a nebula and a star cluster creating an other-worldly ambience, especially once we reached the exclusion zone and dropped to normal space. Very eery. A skip through the Lagoon Nebula and onto the much prettier Cinnabar Moth Nebula. 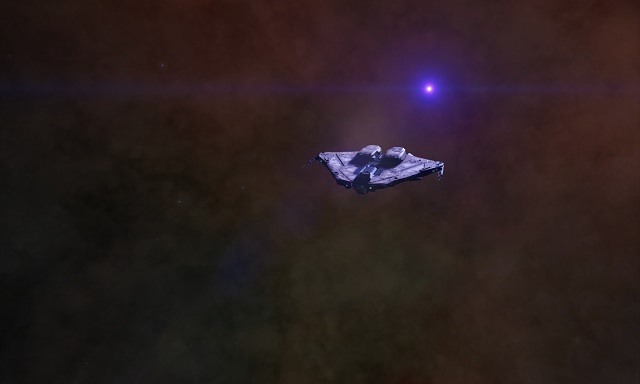 It looked wonderful on approach from 250lys. Now heading for the PW2010 Supercluster, but camped for the night on planet B5 in Traikaae PF-L b38-1, in a binary orbit with a waterworld. There's a grand view outside the cockpit of a fumarole field and the waterworld looming large above us. Should reach Omega Sector VE-Q b5-15 and the asteroid base of Omega Mining Operation tomorrow.